Detention Centers, Militarized Red Zones and Mass Evacuations planned for Downtown Chicago During NATO. The plan to evacuate Chicago seems to be picking up stream. 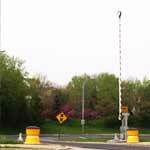 The Illinois DOT’s testing of these highway entrance ramp gates has many worried about the chaos that NATO may bring to Downtown Chicago. There is already talk about widespread city wide evacuations, rioting, terrorist attacks and even large scale detention centers and arrests. I think they have enough people inside the occupy movement that they feel there will be activity by that group during these meetings and they are preparing to deal with it. I read also today that a memo was leaked from Red Cross headquarters that the feds expect major trouble during this conference and Red Cross has been put on alert. These anarchists follow all meetings like this and try to cause as much destruction as they can, would be foolish not to expect the same here, and to not be prepared. And many in the occupy movement are also anarchists, especially in the leadership of the occupy movement. They would love to give America a major blackeye to the rest of the world. WOW! back in the 60’s when we protested the vietnam warwe wre just americans protesting for a caouse we believed in and it was our right! NOW it is illegal to protest against our goevernment. reminds me of Syria,Iran,Egyt that we bombed because they were not letting people peaceably protest! Now they are anarchists, my god where are we going! We are coming to the end of the reign of the dark lords upon this planet. We are nearing ascension of Mother Earth and the souls upon her will ascend with her, all but the dark ones. They will not be able to live as the celestial energies pouring in, will not allow evil to exist anymore. Say goodbye to them and ask for god’s grace to bless them in hopes they one day return to the light of LOVE. So when you hear statements like the one above, you have to forgive them, for they know not what they do. Wow I agree with Bill. This is America and we should be allowed to protest. I don’t like any of this happening. More people need to stand up and protest. We are the 99 percent. This is not the 60’s dude! 2012 is here and so is the end maybe. one thing for sure people are more evil now then compared to the 60’s. Keeping it real and being prepared . The evil ones are the globalists and their armed minions. Our State Dept. worries if citizens in other countries are allowed to protest, but they don’t permit their own citizens to do so. Makes you wonder whose side are they on now? Chicago has been putting up gates on the expressway enterance ramps for the past couple of years. They can “shut down” the expressways any time the want. Chicago has been very busy expanding their camera systems, first red-light, now spped cameras, where if someone wanted to speed their car would be ruined because of the spped bumps which prevents someone from speeding. The sad thing is you have no idea how completely anti-American your statement is. Anarchists I believe can be part as well as agents provocation, one may do well to carry bright colored spray paint and “x” the backside of any instigator as an “agent” would certainly fade to the back. It, of course, is insane to hold a nato summit in a highly populated city, unless one actually wants to cause problems. Any step to assist in more gun control until all guns can be banned… well except criminals and government, of course. When finalized only decent people will be left defenseless, so, hold the summit in one of the most gang ridden cities in USA. I have grown suspicious of everything I read. But, I do not disregard any possibilities. Why so public on the security measures? 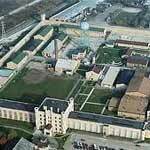 Why the possibility of reopening a prison? Why so much alleged security now when this has not been done in the past? Why is such a meeting taking place in one of the most densely populated places on earth? I wonder how many agent provocateurs have been recruited to turn a protest to a riot? Will we see the first public use of the microwave guns? Will this be an event that triggers martial law? Why the need for evacuation planning for a riot? Is this all hype to keep the sheeple off balance and nothing happens. Tony I think you are on the right track…It’s a ‘honey trap’ for Anarchists/OWS etc. at its least…setup for a false flag at its worst. To me, it’s time we stand together as free (or wannabe) citizens of the freest country in the land. While I don’t agree with much of what I hear out of the “occupy” movements, I’m in agreement that the bigs need to be stopped. This includes all those that use their size at unfair advantage, like big government, big green, big hollywood, and certainly big business. This we should all be in agreement on. The sooner we stop letting the bigs divide us, the sooner we can get back to the principles of our founders. the only terrorist attacking Chicago is the government of the united states…….BY GOD MAN LOOK UP THE DEFINITION OF TERRORIST…..then you tell me………….get out of the way people let em have the slums if you want to make a stand let it be at the foot hills of the rocky mountains that’s where the big herd animals are that the only place you will be able to survive for any length of time…. I live in Thurmont where the G8 summit is being held. They are taking precautions for any trouble that may be caused by putting people on watch and bringing in police and small groups of military personnel. The schools were closed for traffic problems on the 18th. But the reason I’m trying to get across with this is that when a town of 7000 is having troubles they are much easier to fix then in a city like Chicago and that’s why they’re taking precautions. People …. Music is the only way … soon a new crop will surface and shut this down ….. It is a race against time and please drop everything for the music when it comes it isthe only thing we have to stop them in their tracks I will be here soon !!!! So are they going to “practice” by actually using it at some point? You know, a drill of some kind. Sure and we’ll place the “bad guys” in detention warehouses just for the full affect….HELLO!!! We better stop this stuff before it goes too far. I just want to piggyback on Bill’s comment. I’ve been thinking the same thing. It’s time we took our Rights back. america is long gone……havent you heard about the “hr 347bill” SAY GOODBY TO YOUR FIRST AMENDMENT!!! !THANKS ALOT OBAMA FOR PASSING IT WITHOUT ANYONE KNOWING!!!!!!!!!! ITS TOO LATE WHAT ARE WE GONNA DO WITHOUT FREEDOM OF SPEACH!!!! Wouldnt it be great if everyone stayed home from work & shopping & – nobody turned up to protest or even be on the streets. Keep the children home from school. These guys want trouble DONT GIVE IT TO THEM. This would speak louder than words and protests in these troubled times. They want to be noticed & like naughty children they will do anything to cause more arrest to put more money in their pockets & bring down new laws to entrap more people. They have probably hired thugs to start riots. Are you game AMERICA the world is watching, even down here in New Zealand. America will be over when they try to take away our guns. If we let them do that than everything else was for nothing. I dont think we are winning right now, they dont like us. We’re here to work and make profit for them anyway. While we struggle, they sit back and do whatever they want with little to no worries. They use things like race, money, food, religion to turn us against each other. We dont have no one to blame but ourselves actually. But whatever. I’ll just smoke my cigs and drink my beer. We can all agree that the world is one of illusion, shadows and lies. We are spoon fed perceptions and taught to accept it. The media, our schools, movies etc. all are tools used to indocturnate us. Many other tools and methods exist and are readily used. To piss and moan is beyond futile. To protest is pointless. What is in place and what awaits is set in place and shall soon come to pass. What is best is to be prepared, to form collectives where support exists. Have a plan and be prepared to work it. If the worst comes to pass at least there will be groups who are ready to persevere and work towards a new tomorrow. The only thing they fear is our collective. By absolving our barriers and distance from one another we can rise up. As my greatest duty as a patriot and American I stand to protect the freedoms which we formed. Defending these freedoms against any enemy foreign or domestic. I stand to lead a nation to a better future my name is Brandt A, Karstens. I may lose my life doing so but it is the noblest act to protect others and that is what I will do until I fall or achieve victory. The enemy is our federal government and it’s following nations which lie and deceive us there is no other greater enemy then them as they prepare to extinguish our life’s as undesirable people or enslave us all. Barack Obama will set free his evil plan to attack me, even thou I have my right to stand up! Now I will send this personal message to you Mr… President. The People who fallow are from all walks of life as we are united and protect each other in this time to suppress our great enemies. Any nation, Any state, Any city, Any person Any army, willing to follow for a greater nation and greater future may follow. Any person who defies this code of freedom or challenges It will suffer fierce and violent actions with no remorse. I am not a terrorist I am a voice of freedom itself and I will stand my ground alone if need be to protect the millions of Americans and nations who seek help even if they follow or not! If my numbers are correct there is 200 thousand of you who seek to destroy freedom and 300 million of us who seek freedom! You decide to surrender or fight make your decision because we will be equipped and ready for war.